What makes a good survey design for Outlook? This article explains how to design a survey for Microsoft Outlook and some of the potential pitfalls. If you’re looking to insert a survey directly into Outlook itself, then take a look at this page: “How to insert a survey in Outlook“. And don’t forget to sign up for a free trial account which gives you 10 surveys that you can use to create Outlook surveys with Customer Thermometer. Corporate IT departments have a tough job. They need to protect their systems, data and employees, yet still provide the latest and greatest tools and applications in response to employee demands. It’s a hard balancing act and there is always compromise between usability and functionality versus security. Microsoft’s Outlook is used by 95% of corporate organizations, as the client into their Exchange servers. It’s familiar, it was launched in January 1997 and so it’s been around for 20 years and everyone gets it. It does have some nuances though, that not everyone is necessarily aware of. In early versions, default settings in Outlook disabled all images displayed within an incoming email. In our opinion, it’s an unnecessary throwback to the 90’s when images were perhaps seen as a bandwidth overhead and could also be associated with viruses. Neither issues are relevant today – instead, it just becomes an annoyance for the end user. Often, it’s simple to change the default or you can also enable images on a per email basis. However, it’s also possible (although unusual) for a corporate admin to lock down those default settings so that a user could NEVER see an image within an email, unless it originates internally. It’s draconian, but it can happen. 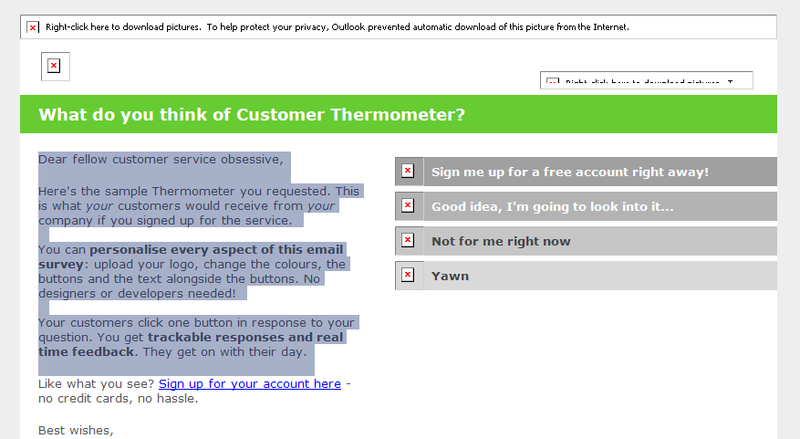 If you were to send an email newsletter OR an Email Thermometer from Customer Thermometer to users with this unusual locked down situation, the email would look something like the image shown above. Note that the links would still function, however it’s ugly and is unlikely to get a response. A few years ago we recognized this issue and took some action! 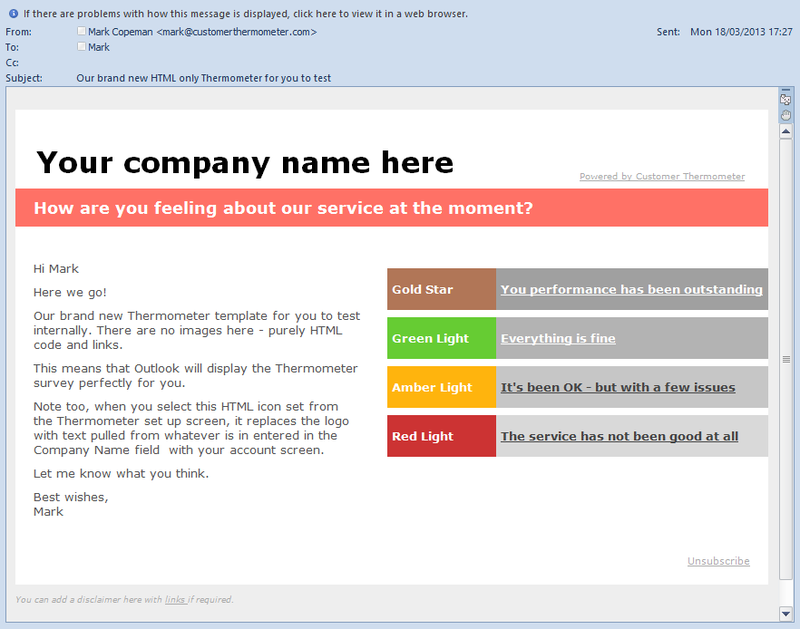 When you receive an email newsletter which has a nicely laid out HTML table of images and text – sent by a service such as MailChimp, or an Email Thermometer from Customer Thermometer, the images are stored externally on a server and the email calls each image in turn to be displayed within your email. The Outlook client can then block these external images. When you set up a signature within Outlook however, things are very different. In this case, the images are NOT hosted externally. Instead, they’re embedded within the email source itself and so images within signatures CANNOT be blocked by Outlook settings as they are integral to the email source. 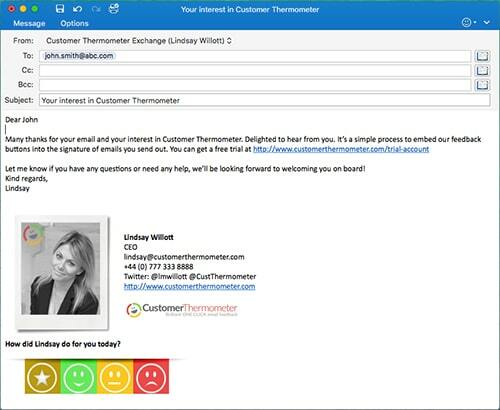 If you are looking to send a single Outlook survey email to a list of contacts – perhaps polling them monthly on how they’re feeling about your service, Email Thermometers work a treat. 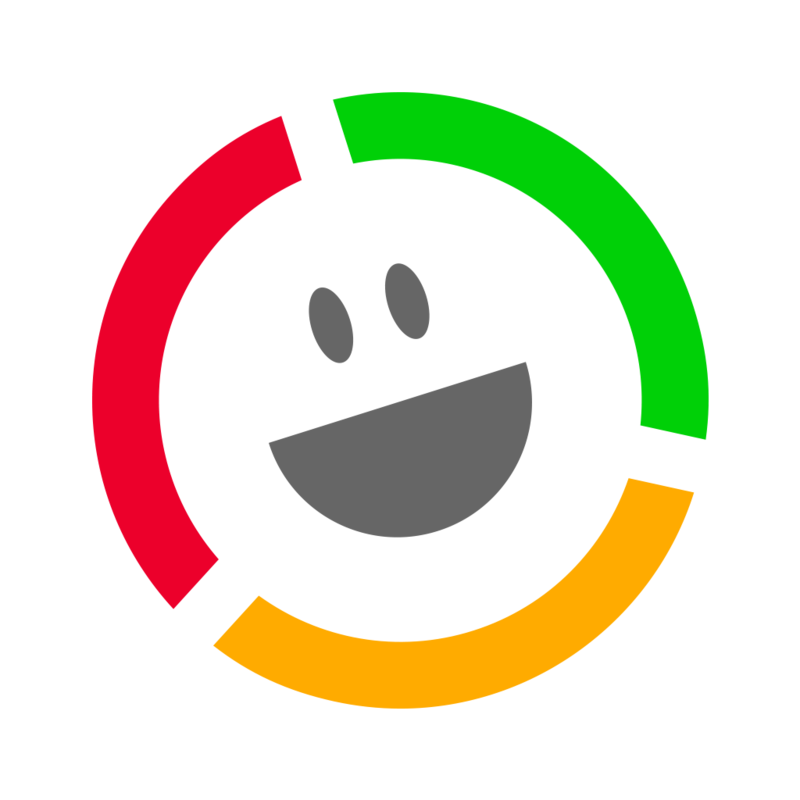 Customer Thermometer contains an HTML only Thermometer template. 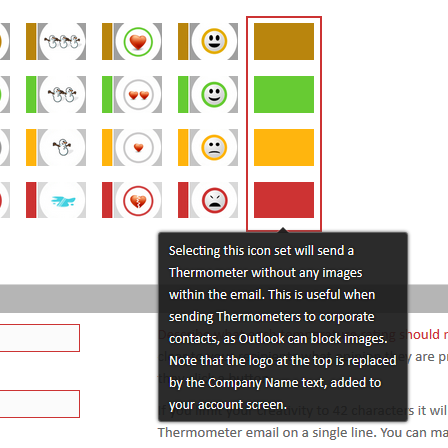 This means that if you are sending emails into or within a locked down corporate environment, Thermometers will always display correctly, irrespective of whether images are enabled or not. To enable this template, simply build your Thermometer as you would normally, and from the icon set, choose the last set of images. These are actually HTML generated coloured rectangles, as opposed to JPG’s. When selecting this template, the system also disables your custom logo, which normally appears top left of your Thermometer. Instead, the text stored in your company name field, within your account settings will now be displayed. The Thermometer survey design works in exactly the same way and your uploaded logo will still display on your landing pages. 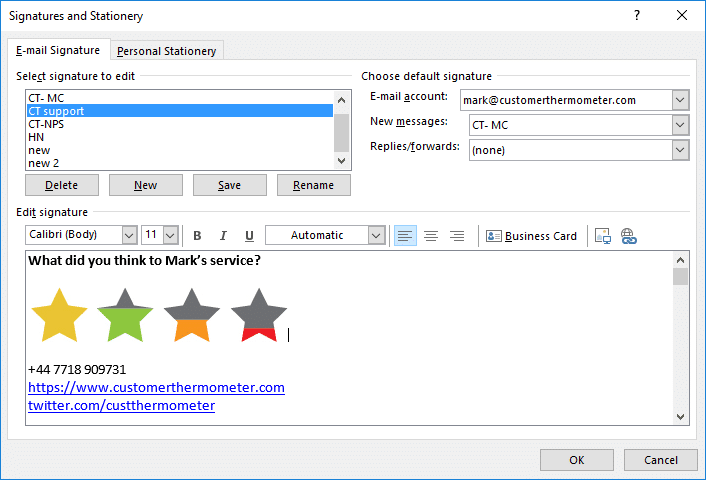 If you are looking to add 1-click buttons to your Outlook email signature, Customer Thermometer offers the ability to do this too. Remember these images are embedded and so will always display. Note that you could include this as a default, or like many customers of ours, you could use choose to switch them in at relevant points in communications too. 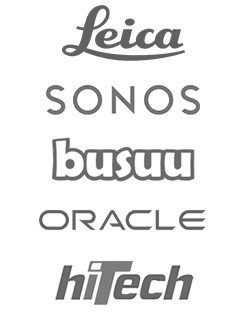 Like the idea of email signature surveys? Read all about how to do that right here – How to Insert A Survey into Outlook. Want to start designing your own Outlook surveys?